My friend Kara is my unofficial new soap tester and likes to recommend new ideas to me! 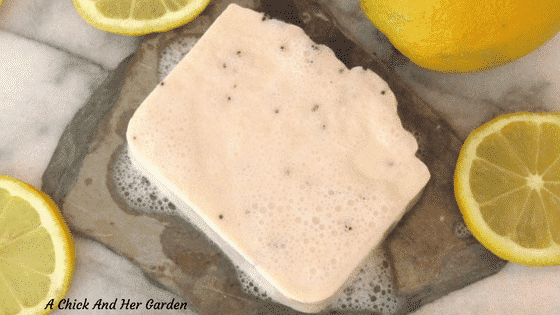 Recently she asked if I’d give a Lemon Poppy Seed soap recipe a try! The timing worked out perfect though because lemons make me think of sunshine and we could use it right now with Spring teasing us! It’s a crisp (I’m being optimistic here) 29°F on the third day of Spring, with the sun peaking out at least helping me think it’s nice out. 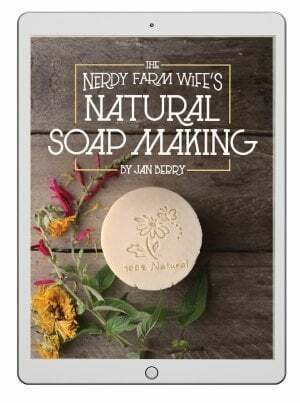 My love of natural soap making started when I read The Natural Soap Making Collection by Jan Berry. The collection includes 3 eBooks about Natural Soap, Shampoo Bars and Milk Soap, and it taught me everything I needed to create my own soaps and recipes including how to incorporate natural ingredients. For my Lemon Poppy Seed Soap Recipe I included, you guessed it, lemons and poppy seeds! 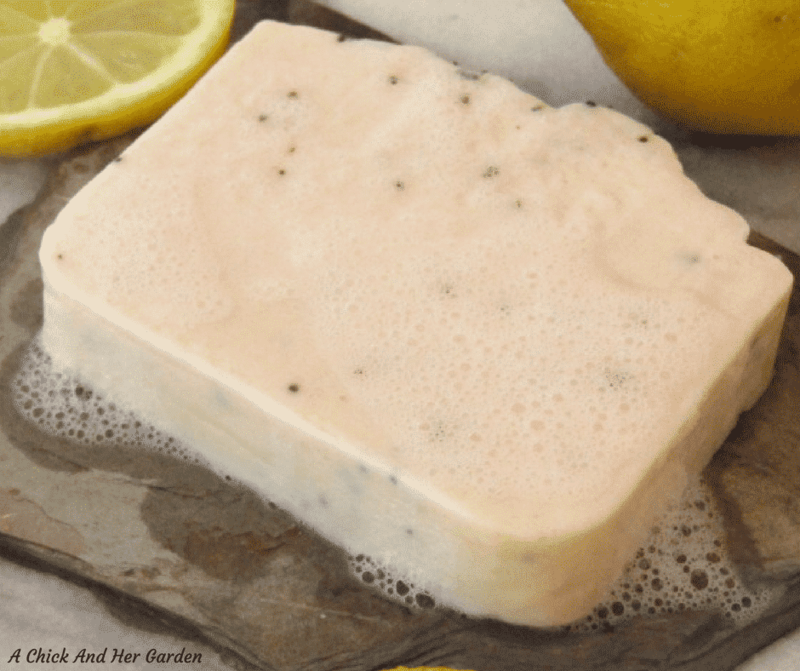 I like to look for the benefits of the natural ingredients in my soaps before I make them and here are a few of the Lemon Poppy Seed soap recipe. Poppy Seeds are used for exfoliating and because they’re rounded they are really gentle. Lemons are antibacterial and antiseptic naturally, but they also include calcium, vitamin C, magnesium and potassium. These nutrients are naturally conditioning to your skin hair and nails. Lemons also act as astringent leaving your skin smoother! So, if you’ve yet to learn how to make soap I highly recommend grabbing The Natural Soap Making Collection before we get started. If you’ve done this before, here’s how we make it! Start by weighing out your distilled water in a heat safe container. Weigh out the lye in a dish used only for lye. Next, we’ll weigh out our oils, starting with your Shea Butter. Heat the Shea butter until liquid. Weigh out each Castor, Lemon Infused Olive Oil, and Sweet Almond Oil and adding them to the liquid Shea Butter. I wanted a lightly tinted soap instead of bright white so at this point I added 1/2 tsp Yellow Brazilian Clay to the oils. Allow the liquid mixture and oil mixture to sit until they’ve cooled to a temperature between 90-115°F. While you’re waiting it’s a good time to line your mold if you’re using a wooden mold. Once they’ve reached the right temp, drizzle the liquid into the oils. Use your stick blender to stir and mix in 30 second intervals until you reach trace. Add the lemon essential oil and poppy seeds and stir in. Pour into your loaf mold and sprinkle the top with the extra poppy seeds. Cover and wrap with a blanket or towel. Keep an eye on your soap for a few hours to make sure it isn’t overheating and remove the blanket if you see a crack. Remove from the mold and slice into bars. Allow the bars to cure for 3-4 weeks. Again, I know, that is forever!! But, well worth the wait! 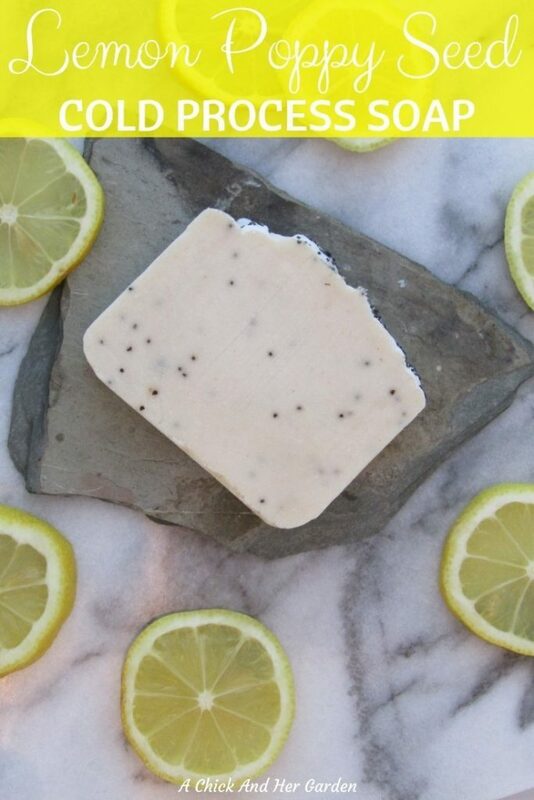 This Lemon Poppy Seed soap recipe turned out so refreshing and is perfect to remind us that Spring is coming! Looking for tips on making your own natural soaps? I can’t thank the Natural Soap Making eBook Collection enough! I refer back to it for every recipe I write and you can grab your copy here! Next, we'll weigh out our oils, starting with your Shea Butter. Allow the liquid mixture and oil mixture to sit until they've cooled to a temperature between 90-115°F. While you're waiting it's a good time to line your mold if you're using a wooden mold. Once they've reached the right temp, drizzle the liquid into the oils. Keep an eye on your soap for a few hours to make sure it isn't overheating and remove the blanket if you see a crack.